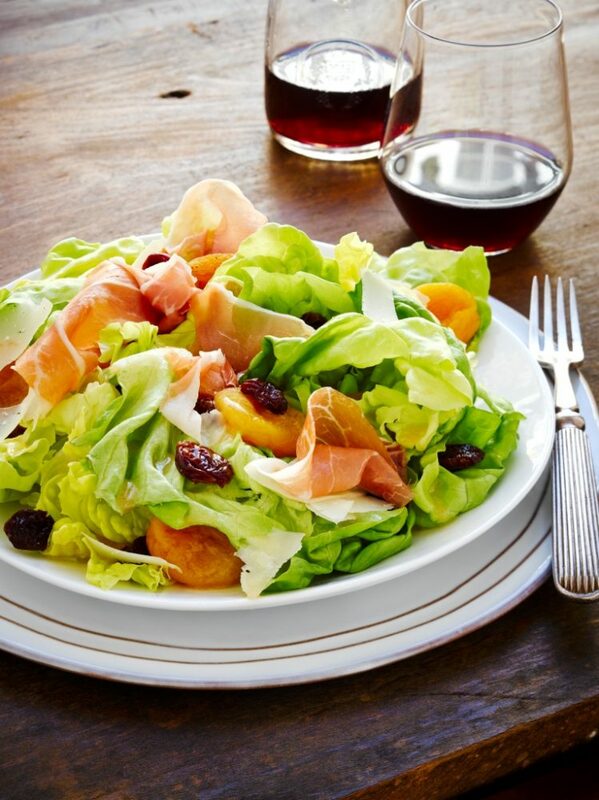 This impressive prosciutto salad really plays up the contrast between acidic, sweet, and herbaceous. Crisp greens and ripened, dried fruits add an elegant note elevated with an Italian flair, thanks to silky slices of Prosciutto di Parma and shavings of Grana Padano. We also love the sweet-savory packed punch the dressing adds to the mix. For optimum flavor, be sure to allow the cherry and apricot brine to marinate for two hours, at the very least. When you’re craving a meal that’s simple, bright and balanced, this impressive prosciutto salad recipe shines. In a medium bowl, combine vinegar, honey, salt, pepper, cherries, apricots and water; cover. Let stand for 2 to 4 hours. In a blender, combine vinegar, honey, shallot, garlic, mustard, oregano, salt and pepper. Blend until smooth. Slowly add olive oil until vinaigrette is thickened and well blended. Toss lettuce with a few tablespoons of the vinaigrette. Divide salad among four plates. Top each with two slices prosciutto. Spoon cherries and apricots around the salad. Sprinkle with Grana Padano shavings.